Hip hop stars tend to do everything in a big way when they break out of the hood and make it to superstardom: expensive drink, six-figure watches, sports cars, tons of women, and of course, gambling. When these guys gamble, they don’t do it like we do, either. When hip hop superstars gamble, they’re not just spinning the reels at online real-money slots costing a few bucks a spin. Let’s see what some of the rap industry’s biggest names like to bet on – and how much they lose! Shawn Carter, better known to the world as “Jay Z”, “Jigga” or “Beyoncé’s husband” depending on what magazines you read, is probably one of the most successful hip hop artists of all time. If you’re measuring this by cold hard cash, then that probably becomes undoubtedly. Jay Z is not only a successful rapper but also a business mogul; he is the former president of Def Jam Records, the founder of Roc Nation, creator of clothing line Rocawear and a certified baseball and basketball sports agent. In short, as well as being one of the best-selling artists of all time with more than 100 million records to his name, he’s also an incredibly successful entrepreneur with a net worth estimated at over $500 million. Last, but not least, he’s a formidable blackjack and poker player – or at least, so he claims. He frequently visits the high-stakes tables at casinos around the world, especially in the UK. It’s reported that he lost $500,000 in a single high-stakes poker hand in Las Vegas. Sounds like he has 99 problems and that bad beats at the poker table might well be one! Bryan Williams, a.k.a. Birdman, the co-founder of Cash Money Records, is one half of hip hop duo Big Tymers as well as a successful solo artist. He founded Cash Money Records with his brother, and later contributed to Young Money Cash Money Billionaires alongside Lil Wayne. Like Jay Z, he has ventured out into other business worlds than rap. He funded a short-lived oil and gas exploration company which, let’s face it, you don’t really expect from a hip-hop artist. He also launched a clothing line earlier in 2016, which is a bit more in keeping with the theme! 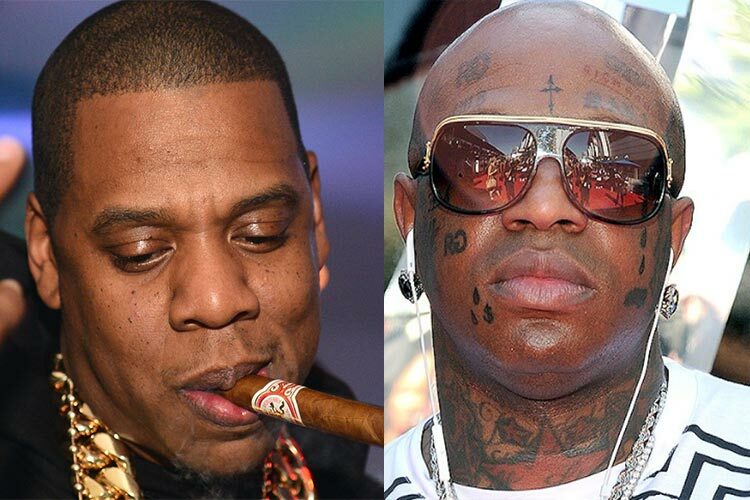 Another thing that Birdman has in common with Jay Z is his love of gambling. He throws his money at the sportsbooks on a regular basis; in 2011, he lost $2 million wagering that the Miami Heat would win the NBA Championship ahead of the Dallas Mavericks. It’s not all bad luck, though; in Super Bowl XLV, he won $1 million for backing the Green Bay Packers and said he planned to back the Patriots to the tune of $5 million the next year! Jeffery Lamar Williams, better known as Young Thug, was a breakout 2014 hit from Atlanta. He’s established himself as a rising star in the world of rap thanks to an unconventional vocal style and rhyme patterns that break hip hop conventions. He’s become one of the most up-and-coming artists in the world of rap and has yet to even release his first studio album. Hy! £UN35 is due to be released sometime. However, as of yet, there is no release date on this long-anticipated album. Maybe that’s because Young Thug is too busy playing cards and not recording? In an interview with GQ magazine earlier this year, Young Thug revealed that he may even enjoy gambling more than rapping. American rapper and actor Nelly, born Cornell Iral Haynes, Jr., began his successful solo hip hop career with the 2000 smash hit album Country Grammar. The third single, Ride Wit Me, hit the top ten in countries around the world. His follow-up album, Nellyville, saw Hot in Here and Dilemma become number one hits that are still played in clubs today. Like many other hip hop stars, Nelly considers himself an entrepreneur and owns energy drink Pimp Juice. Additionally, he runs the non-profit organization 4Sho4Kids. On top of all that, Nelly is a prolific gambler and a big poker fan. He played the 2007 World Series of Poker Main Event and has been something of a regular on the PokerStars European Poker Tour circuit. Unfortunately, it hasn’t panned out for him – he only has $5,153 in recorded live tournament cashes. Curtis “50 Cent” Jackson does his best to completely embody the living large lifestyle of hip hop success – to the point that he’s filed for bankruptcy despite earning millions. But you won’t notice me when that gat dumpin’, you wan’ bet? Fiddy has bet far more than $0.50 in his time. It’s well-documented that in 2012 he bet $500,000 (and won) after backing the New York Giants against the 49ers in the NFC Championship. He also bet $1 million on his former friend Floyd Mayweather Jr when he took on Oscar de le Hoya.